Sometimes life calls for a slightly decadent meal, and why not share it with good friends? This pasta dish is ready in no time at all. Make certain not to overcook the scallops, and don't be shy about using butter. Cook the spaghetti in a large pot of well-salted water until al dente. While the pasta is cooking, melt the butter in a large skillet over medium heat. Add the shallots and the carrot strips. Sauté until both are softened; the shallots should be clear but not brown. Season with a little salt, generously with freshly ground pepper, then add the Piment d’Esplette and saffron, and cook for 1 minute. Raise the heat to medium-high and the wine, cooking until slightly reduced. Add in scallops and cook for a couple of minutes until the scallops are just opaque. Add the spaghetti to the pan (reserving cooking water) and continue to cook until the pasta has absorbed most of the sauce. Add the cream and mix it through. If too thick, add the pasta water a couple of tablespoons at a time. Divide among 4 warmed plates and sprinkle with parsley. 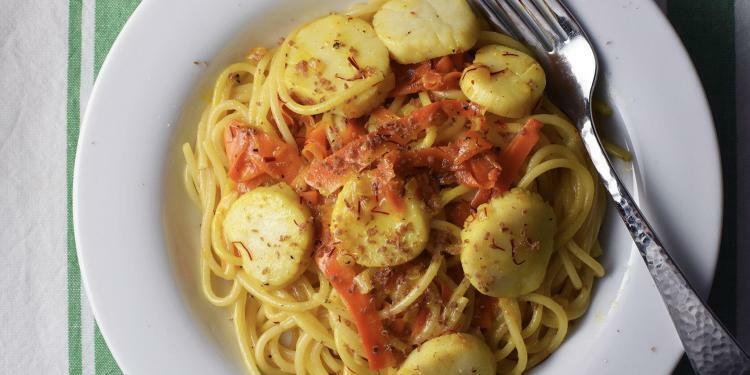 If you are using bottarga, grate a little bit over the top of each plate, and serve. 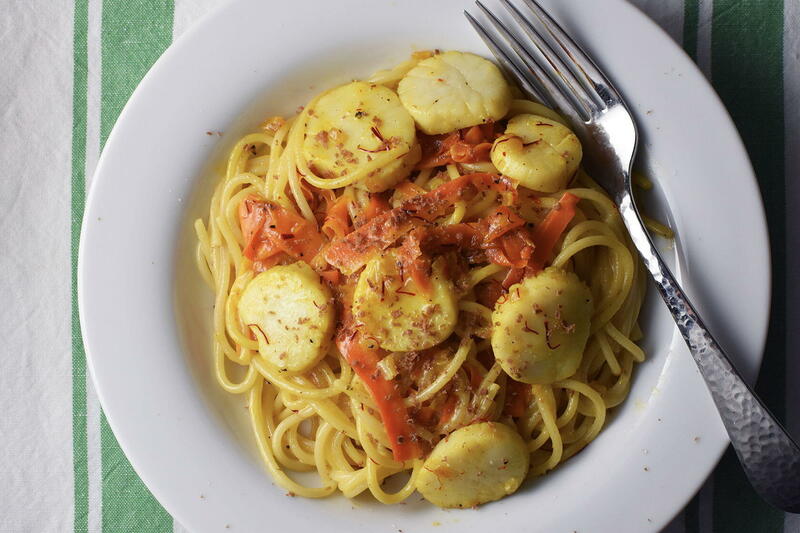 * Bottarga (Italian) is a salty fish roe, cured and packaged for use as a flavour additive to dishes such as this pasta. In Provence, it is called poutargue or boutargue and produced in the seaside fishing town of Martigues. 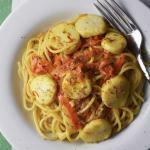 Grate over the pasta dish like a parmesan, although sparingly.